HIGH POINT, NC--(Marketwired - May 02, 2017) - High Point University continues its tradition of bringing renowned thought leaders to campus by featuring Wolf Blitzer, CNN's lead political anchor and anchor of "The Situation Room with Wolf Blitzer," as the Commencement speaker on May 6. The university will award approximately 1,000 undergraduate, graduate and doctoral degrees. 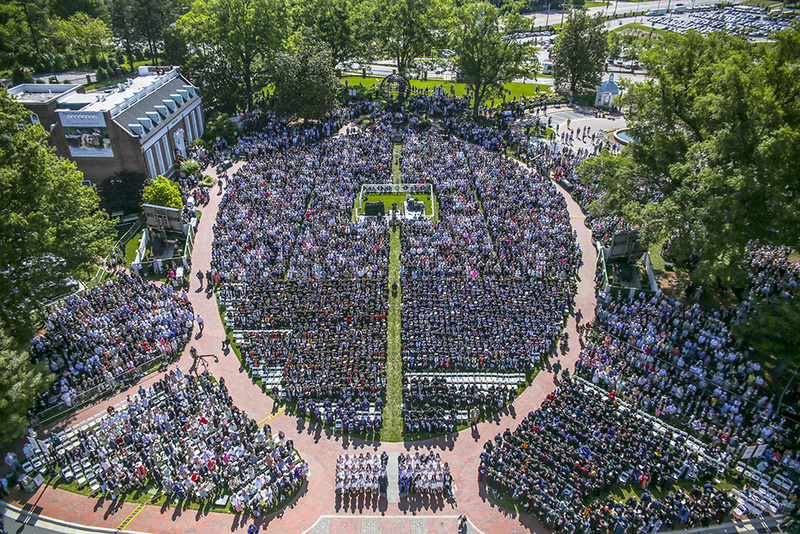 HPU's graduation ceremony will be held at 9 a.m. on May 6 on the Roberts Hall Lawn. The rain site is Millis Athletic and Convocation Center. Blitzer will be the featured speaker. The ceremony will be available via live streaming at www.highpoint.edu/live. The media is invited to attend. For additional information, visit www.highpoint.edu/commencement. What Makes HPU's Graduation Unique? -- Wolf Blitzer becomes part of an extraordinary lineup of HPU Commencement speakers, including the 66th Secretary of State Condoleezza Rice; broadcast legend Tom Brokaw; Gen. Colin Powell, former secretary of state, chairman of the Joint Chiefs of Staff and national security advisor; former First Lady Laura Bush; U.S. Supreme Court Justice Clarence Thomas; Steve Wozniak, co-founder of Apple and HPU's Innovator in Residence; Rudy Giuliani, former New York City Mayor; Her Majesty Queen Noor of Jordan; NASA Astronaut Dr. Buzz Aldrin; and Muhtar Kent, CEO of the Coca-Cola Company. -- Each year, a bald eagle soars over the graduates at the end of the ceremony to symbolize the ideals of free enterprise, independence and the ability to pursue new opportunities in America. -- Spoiler alert: HPU graduates will receive a blanket after the ceremony to give to their mothers in honor of Mother's Day, which is the following weekend on May 14. 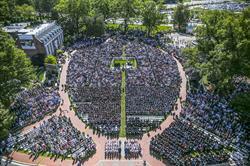 -- Nearly 10,000 people will fill the Roberts Hall lawn for the ceremony. Blitzer has been with CNN for 23 years. Over the decades, he has reported on a wide range of major stories that have shaped the international political landscape. Blitzer was pivotal to CNN's election coverage throughout "America's Choice 2012," serving as lead anchor on key primary nights, caucus nights and election night. He moderated three of CNN's Republican presidential debates, including the first-of-its-kind Tea Party debate. During the 2008 presidential election, Blitzer spearheaded CNN's Peabody Award-winning coverage of the presidential primary debates and campaigns. He also led CNN's Emmy-winning "America Votes 2006" coverage and "America Votes 2004." Furthermore, he anchored the network's coverage during the inaugurations of Presidents Barack Obama and George W. Bush. In addition to politics, Blitzer is known for his in-depth reporting on international news. In 2013, Blitzer traveled to Egypt to sit down at the presidential palace with the country's first democratically elected leader, President Mohamed Morsy. In December 2010, he was granted rare access to travel to North Korea with former New Mexico Gov. Bill Richardson. While in country as the only network journalist, he took viewers inside the communist, totalitarian regime with reports from the rarely seen streets of Pyongyang and Kim II-sung University. Known for his Middle East expertise, Blitzer reported from Israel in the midst of the war between that country and Hezbollah during the summer of 2006 and he also returned to the region with CNN anchor Anderson Cooper in 2012. In 2005, Blitzer was the only American news anchor to cover the Dubai Ports World story on the ground in the United Arab Emirates. He also traveled to the Middle East in 2005 to report on the second anniversary of the war in Iraq. In 2003, Blitzer reported on the Iraq war from the Persian Gulf region. Blitzer began his career in 1972 with the Reuters News Agency in Tel Aviv. Shortly thereafter, he became a Washington, D.C., correspondent for The Jerusalem Post. After more than 15 years of reporting from the nation's capital, Blitzer joined CNN in 1990 as the network's military-affairs correspondent at the Pentagon. He then served as CNN's senior White House correspondent covering President Bill Clinton from the November 1992 election until 1999, when he became the anchor of CNN's Sunday public affairs program, "Late Edition with Wolf Blitzer," and remained for more than a decade. Over the decades, Blitzer has reported on a wide range of major breaking stories around the world that have shaped the international political landscape. In 1982, Blitzer was in Beirut during the withdrawal of PLO and Syrian forces. Blitzer covered the first Israeli-Egyptian peace conference in Egypt in 1977, and, in 1979, he traveled with then-President Jimmy Carter on visits to Egypt and Israel for the final round of negotiations that resulted in the signing of the Israel-Egypt peace treaty. He was among the first Western reporters invited into KGB headquarters for a rare inside look into the Soviet intelligence apparatus; he returned to Moscow in December 1991 to cover the collapse of the Soviet Union and the transition from Mikhail Gorbachev to Boris Yeltsin. Throughout his career, Blitzer has interviewed some of history's most notable figures, including U.S. Presidents Barack Obama, George W. Bush, Bill Clinton, George H.W. Bush, Ronald Reagan, Jimmy Carter and Gerald Ford. Blitzer has also interviewed many foreign leaders -- the Dalai Lama, Pakistani President Asif Ali Zardari, former Soviet President Mikhail Gorbachev, former British Prime Minister Margaret Thatcher and former South African President Nelson Mandela. In 2013, Blitzer was recognized as the sixth recipient of the Urbino Press Award from the Italian Embassy for his excellence in journalism. In 2011, Blitzer received the distinguished Leonard Zeidenberg First Amendment Award from The Radio & Television Digital News Foundation, and The Panetta Institute for Public Policy's Jefferson-Lincoln Award. 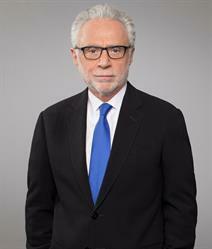 Among the numerous honors he has received for his reporting, Blitzer was a part of the CNN team to earn a 2006 Emmy Award for live coverage of the midterm election. He is also the recipient of the 2004 Journalist Pillar of Justice Award from the Respect for Law Alliance and the 2003 Daniel Pearl Award from the Chicago Press Veterans Association. He was also among the teams awarded a George Foster Peabody award for Hurricane Katrina coverage; an Alfred I. duPont Award for coverage of the tsunami disaster in Southeast Asia; and an Edward R. Murrow Award for CNN's coverage of the Sept. 11 terrorist attacks in 2001. Furthermore, Blitzer is the recipient of an Emmy Award from The National Academy of Television Arts and Sciences for his 1996 coverage of the Oklahoma City bombing and a Golden CableACE from the National Academy of Cable Programming for his and CNN's coverage of the Persian Gulf War. Blitzer has authored two books, "Between Washington and Jerusalem: A Reporter's Notebook" (Oxford University Press, 1985) and "Territory of Lies" (Harper and Row, 1989), cited by The New York Times Book Review as one of the most notable books of 1989. Blitzer earned a Bachelor of Arts in history from the State University of New York at Buffalo and a Master of Arts in international relations from the Johns Hopkins University School of Advanced International Studies in Washington, D.C. In addition, Blitzer has numerous honorary degrees from educational institutions across the country, including The George Washington University in Washington, D.C.; State University of New York at Buffalo; The Catholic University of America in Washington, D.C.; and The Pennsylvania State University in State College, Pennsylvania. Wolf Blitzer, who has been with CNN for 23 years, reporting on a wide range of major stories that have shaped the international political landscape, will be this year's Commencement speaker. 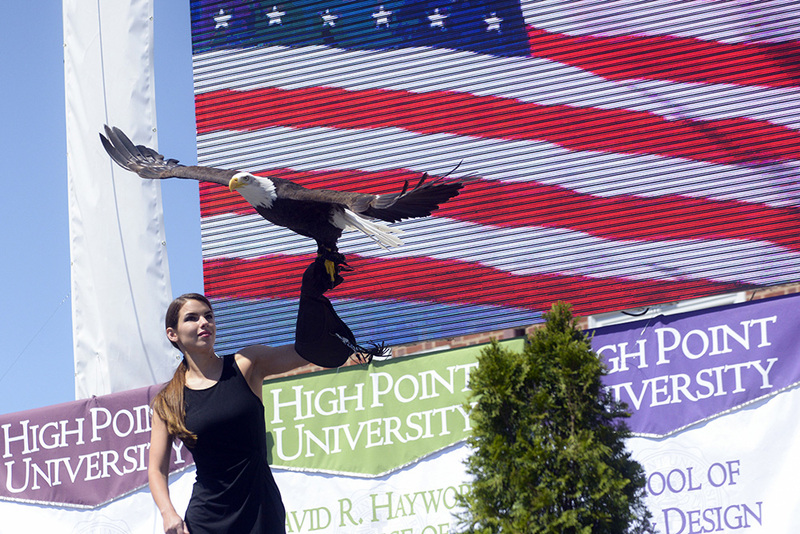 As is tradition during HPU Commencement ceremonies, a bald eagle soars across the graduates during last year's event, symbolizing the ideals of free enterprise, independence and the ability to pursue new opportunities in America. 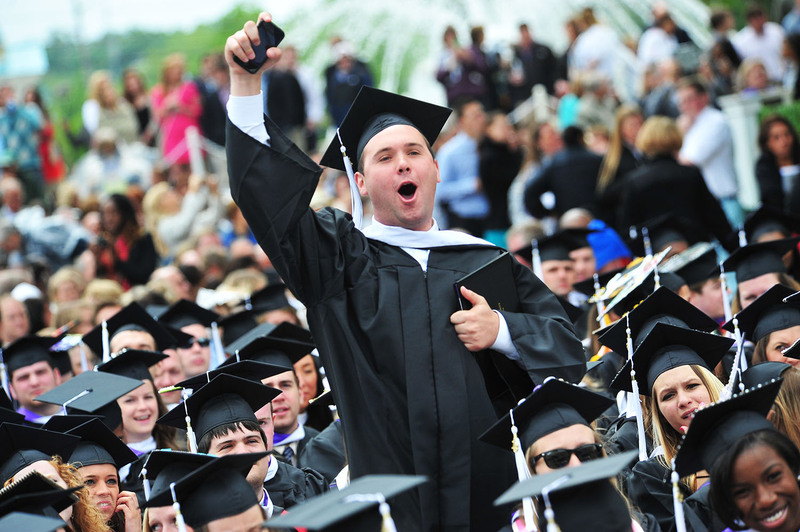 A crowd of 10,000 people attend last year's Commencement ceremony. 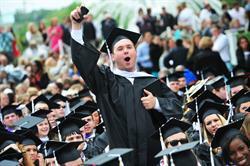 HPU graduate Patrick Budd cheers for his classmates during a past Commencement ceremony.